The Greek government might be faced with a new crisis that deal with the sovereignty of area in the eastern Mediterranean -or namely in the areas of Rhodes and Kastelorizo- this coming spring, since Turkey is determined to conduct hydrocarbon surveys in Greece's Exclusive Economic Zone (EEZ). 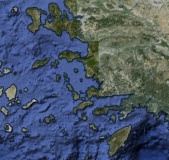 Ankara has actually taken the first steps, or a little before the 2012 elections, when it decided to publish a series of maps of sea areas within the Greek EEZ south of Rhodes and Kastelorizo in the Turkish Official government Gazette. The maps were then allocated for exploration and exploitation to the Turkish Petroleum Company TPAO and according to Turkish newspapers this past week, Ankara plans to begin the surveys in these exact areas in a few short months! It should be noted that when the Turkish government proceeded with the publication of these maps, Greece was suffering from a political crisis, or basically trying to pick up the pieces after the fall of the Papandreou and Papademos governments. At the time, Greek politicians did not place a great emphasis on this Turkish move because they were obligated to occupy themselves with the issue of forming a government. In fact, aside from a few news sites and blogs, the revelation of this move almost went unnoticed. Since then, the insistence of specific political parties to only focus on the economy, and not on our national issues, only added to this indifference. In our opinion these parties want the Greek people to only be focused on the economy, because their agendas on our national issues do not really follow a patriotic line. And based on the same maps, the Turkish EEZ is linked to the Egypt's EEZ, cutting through Cyprus EEZ as well. Before the publication of these maps, dozens of incidents were noted near the area of Kastelorizo (military tension such as aircraft overflights, without encountering any particular Greek diplomatic reaction steps beyond the usual protest). Of course at the time, PASOK was in power so this does not surprise us. In Athens reports claim that the government has been under a kit if pressure from the US not to proceed in proclaiming its EEZ because it would lead to a heated incident with Turkey. Specifically, a report in the "To Pontiki" newspaper said that Greece should first stomach what the West wants, and at the same time forbid Russia of buying out the state owned DEPA and DESFA because they would become an energy monopoly in the EU. All these energy games are being played as we speak in the Eastern Mediterranean and our nation is right smack in the middle of it all. Basically, the insistence of some political parties to continue focusing our attention on the economy and away from such issues only allows foreign interests to do as they wish. Basically all these complex and dangerous games are being played on the backs of a helpless Greek nation to ultimately control our energy reserves (and future transportation routes). On the one side its the US, on the other Russia, and in the middle Europe. Three different positions, three different points of interests, and a little Greece who is paying the dire consequences. The trouble is, the first two nations are superpowers and as the "To Pontiki" newspaper points out, Washington does have the means to remind the Greek government (and especially Germany) that no "strategic" settlement of any sort can happen in this region, without its approval. The Greek coalition government is trying to balance itself on a diplomatic tight rope. On the one side the German stranglehold of Greece, and the other the colossal strategic / military influence of Washington. To top that off it has to deal with Ankara, who has high aspirations of becoming a huge regional superpower. We do not know what the Greek government will do, nor what strategy it plans to follow, the only thing we do know here at HellasFrappe is that when you are faced with a cliff on one side, and a volcano on the other, and are forced to jump, you would probably take your chances at something that would hurt less. SHOCK - Ambassador Says "BlackWater" (Mercenary Army) Hired To Protect Greek Parliament!